It's official - 2019 has started. Life is happening on every corner and I wish you many beautiful experiences this year. To really embrace the new, we, human beings need to let go of the old. Close the previous chapter for the new to begin for real. Yes, transitions! I love talking about them and stepping into a new year is the most regular and obvious transition we go through every year. No wonder there are so many people advising us to make resolutions and promises to ourselves what we will definitely change this time. Only to experience a flop! of falling off the wagon. So I say - please, take the time and the calmness to properly close the previous year if you haven't done so already and leave the resolutions for later. You might ask: "But, Neža, what if it was a really good year?" Do the same, dear! 'Closing' doesn't mean trashing or disposing of all the good that has happened. 'Closing' means giving it attention, honouring the valuable lessons you got from those moments and celebrating the growth you noticed in your being. It's funny, just before I closed my business for the holidays, I had a really great session with one of my regular clients. A smart, young woman, whose wish is to get more consciousness in her boundaries at work. As a farewell before 2018 ended, I gave her one last homework. I asked her to reflect upon 3 extremely powerful questions and a few days later I got a beautiful video from her sharing her answers. A few days later I got a video in my Whatsapp inbox from her boss as well. The closing ritual got passed in the company - so cool! In their videos, they shared really heartfelt reflections of learnings, gratitude and expansion of spirit, skills and understanding of who they truly are. I was truly touched. "So, Neža, what about you? We'd love to hear about your growth in 2018. Would you be willing to share?" It is such a funny moment when you get asked your own questions back and remember; oh, yes, sure, doooooh, it's my turn to reflect consciously, it's important to stop and take the gear off the autopilot. You see, asking myself these 3 questions became a daily practice for me. I decided to incorporate them in my life a few years ago and what I noticed is that I get so much energy from appreciating life happening around me this way. I dearly believe the level of my resilience, ability to spot opportunities and beauty comes from living with these 3 questions. Do you know what's coming at the end, my dear? Yesss, you are right - I will invite you to do the same and look back at 2018 with a gentle look, picking out cherries for your treasure memory box. Doing this type of reflection has the power to bring you even more strength, determination, focus and certainty in what you are doing. You game? Here we go. Me first. I am grateful for my and my family's health. It might sound like a cliche but it is so true. I am so grateful that my mom is happily travelling around the world at 67 with the amount of energy many people of my generation cannot put together. I am grateful for the will for life in my mother-in-law. I am grateful for my resilience. A quality that showed so handy this year. Ok, and the last few years. More specifically, since I decided to become an entrepreneur. Bouncing back from countless changes I have been confronted with. One of them being, my husband finally getting a job he so much craved for. You might say - but that is cool, isn't it? Yes, I am grateful for the gift of stability. I am also thrilled for him coming home full of stories, challenges he loves encountering, learnings about his new position. On the other side, him starting a full time position after years of entrepreneurship meant also me being confronted with taking ove the majority of the household chores. Before we did everything 50-50 but now I needed to organize myself better in meal prepping, cooking, shopping and keeping the house somewhat tidy (ehm, sometimes that miserably fails and I am learning to let go). The challenge was: how to make it easier for myself, set my boundaries and infuse it with enjoyment again. I needed about 4-5 months to go from the shock, denial, anger, resentment, towards readjusting and finding ways to enjoying the cooking on such a high rotation. Confession: I found some amazing cookbooks, started bingewatching cooking videos on YouTube in the evenings, bought a bunch of great kitchen accessories and threw away scratched pans from student times (student times, can you imagine!!!). I am grateful for having the chance to work with so many great, quality people. By quality people, I mean innovators in education, daring individuals who are busy with challenging the status quo in education, climate change, entrepreneurship, presence in this world and more. With people who stand up for themselves and for the causes they believe in. By quality, I mean people who love this planet and are making a difference 1 step at a time. I used to be afraid of clients becoming friends. But now I know this is simply what happens when you do work from the heart. I love the friends I made this year. What have you done, started or achieved in 2018 that fills you with pride? Wow, 2018 was THE year for so many firsts! I am really proud of myself that I launched, produced and executed the program I dreamt of for over 3 years. In 2016 I had an idea how to move my business online. But I didn't want to compromise the quality of interactions that happen at my 'offline' trainings. This year, Wise Career Choice program came to life for the first time. It was soooo much work. And so worth it :) In 7 months, I offered a program that had yet to be finished. I wanted to avoid me procrastinating and losing myself in perfectionism (can you relate?) so I decided to take a chance and offer it without it being finished. The brave women who joined the program were giving me amazing feedback so I could build a program catered to questions from women in real life situations: in a burnout, with lost connection to their work, in doubt how to continue. Result? 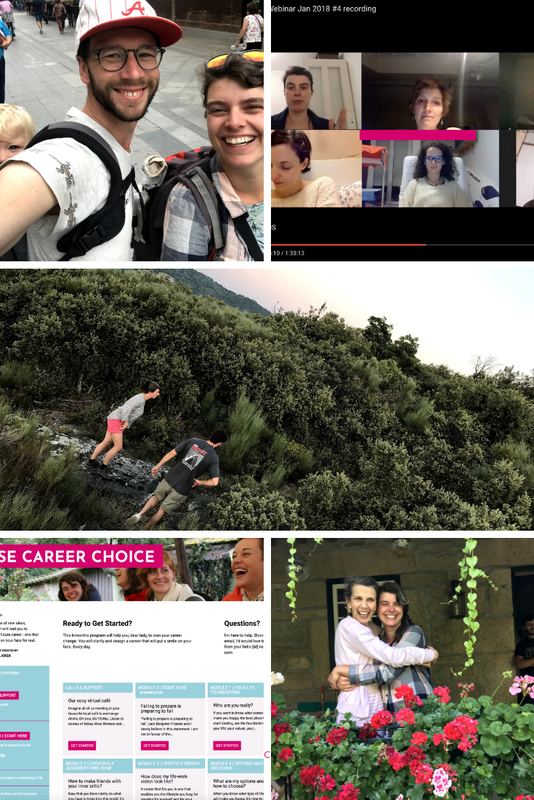 over 100 step-by-step videos, worksheets for every video, experience with the ups and downs that women experience during the program and a ton of material for the future. I am sincerely proud of being able to pull this off on a part-time working schedule. I am thrilled to have been invited to co-author 2 books. Both with the same focus but in such different contexts. The focus being: helping people design what type of work will make them happy. I told you about the first book (in Slovenian) before, but the second one got released in December. 'Eerste hulp bij klimaat verandering, or #EHBKV by Anabella Meijer and a super cool gang of collaborators. The challenge I am proud of here is that the author is one of my first clients, turned friend and entrepreneurial co-conspirator :) This is how I love to work - creating bonds that last for years and nourish all the people involved. I am proud of having created a career for myself where that is in the forefront, without compromise. I'm also really happy I can have so much fun in what I do. The peek of that fun was entering the stage on a wooden ladybug. Ha? Ladybug? Stage? Yes, when Anabella and I designed the program for the launch of her (our) book, I couldn't resist borrowing Svit's wooden ladybug and make my way to the stage on it. so much fun to present the content of a book about climate change and superheroes dressed like a superhero in a repurposed old towel. Where have you seen the beauty around you? I found it so beautiful to see when our son immediately starts dancing to any music he hears. I started dancing with him as soon as I could be on my feet after birth and I guess my love of movement is being passed on. Little hands in the air, a big smile on his face and wiggling hips left-right with an occasional turnaround. Magic! I saw beauty in the number of birds we get in our garden. They love to hang around, make nests (ok, they poop a lot as well), quarrel and squeak when negotiating the next bird move. I saw beauty in the family vineyards of my dear friend, Margarida, in the port wine region in Portugal. This year, we went to visit them 7 years after I taught along with her at the local school. Going back to the place where I made my decision that led me to start my own business as you see it today was a powerful experience, enriched by stunning views over the river Douro, climbing the local hills and embracing the view of the whole region. Oh, drinking port wine, hearing about the love that goes in the process of making it and enjoying it with dear friends was pure bliss in itself. I saw magic happening in the interactions I witnessed between our son and his Dutch and Slovenian grandparents. Such different interactions, equally profound bonds. Lots of giggles and numerous very wet baby kisses. I saw the beauty of what can happen when women meet with regularity online and share the same query: What career will make me happy? The depth of understanding each other when daring to open up to questions like Who am I really? What is it that I really want for myself? How can I ask for that without feeling strange? How do I show my talents in an authentic way? How do I deal with all the fears that pop up in my mind and heart when I get closer to my core? I was sincerely in awe of what can happen in a circle of women who give it all. It was beautiful and moving. I could go on. It's been such a rich year. A year that tested me and my boundaries. A year that offered me a taste of how it feels like when you step into your true power and own it. A year that started my next wave of emancipation (will write about that soon). A year that made me focus and say NO to shiny looking like distractions disguised as opportunities. A year where I started letting go of how certain relationships 'should' look like. A year where I tripled my client base and committed to writing and sharing my thoughts without thinking they are not worth sharing. This was my 2018. Now I am curious - what was your year about? If you wish, feel invited to share it with me in the comments. I am here to witness. Maybe even consider sharing it with people who you'd love to involve in the expansion that you are planting for yourself in 2019. Sending you lots of love and gratitude for 2019!